Beginning July 1st, 2015, the trash cans of New York City will be less crammed with Styrofoam cups, clamshells, packing peanuts, and other single use, non-recyclable Styrofoam products as the city becomes the largest yet to ban Expanded Polystyrene (EPS) plastic foam. Cafeteria Culture, a grassroots effort to reduce trash in public schools and find climate smart solutions, helped galvanize the effort to ban Styrofoam from school lunch rooms, and on January 8th, Mayor de Blasio’s administration announced the city-wide ban after EPS was officially determined to be non-recyclable. New Yorkers can look forward to cleaner streets and waterways and a reduction in harmful chemicals in local landfills, and the impact in the public schools will be dramatic. Instead of the billions (yes, 3 billion!) Styrofoam trays the schools have been using for the past twenty years, cafeterias will begin using compostable plates starting this spring and summer. Local non-profits, various divisions of the Mayor’s Office, and environmental groups cited their support for the ban as well — and hope that the movement will inspire other cities to adopt similar strategies for a greener future. Beginning July 1st, 2015, the trash cans of New York City will be less crammed with Styrofoam cups, clamshells, packing peanuts, and other single use, non-recyclable Styrofoam products as the city becomes the largest yet to ban Expanded Polystyrene (EPS) plastic foam. Cafeteria Culture, a grassroots effort to reduce trash in public schools and find climate smart solutions, helped galvanize the effort to ban Styrofoam from school lunch rooms, and on January 8th, Mayor de Blasio's administration announced the city-wide ban after EPS was officially determined to be non-recyclable. New Yorkers can look forward to cleaner streets and waterways and a reduction in harmful chemicals in local landfills, and the impact in the public schools will be dramatic. Instead of the billions (yes, 3 billion!) 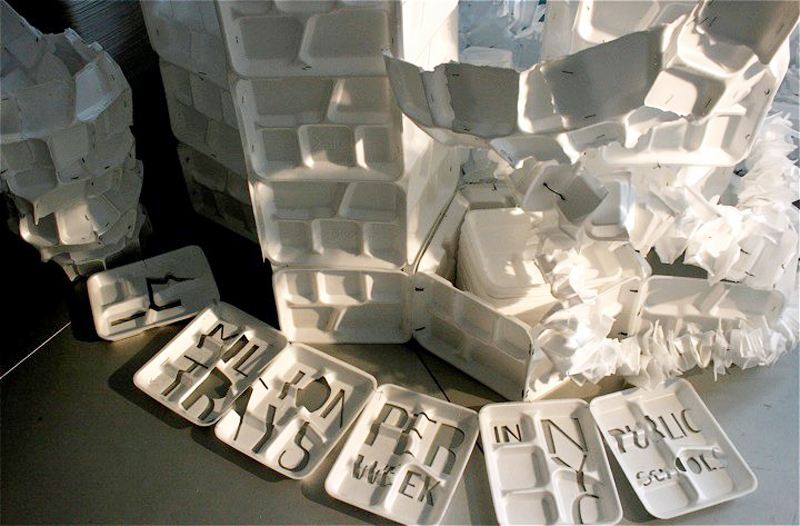 Styrofoam trays the schools have been using for the past twenty years, cafeterias will begin using compostable plates starting this spring and summer. Local non-profits, various divisions of the Mayor's Office, and environmental groups cited their support for the ban as well -- and hope that the movement will inspire other cities to adopt similar strategies for a greener future.